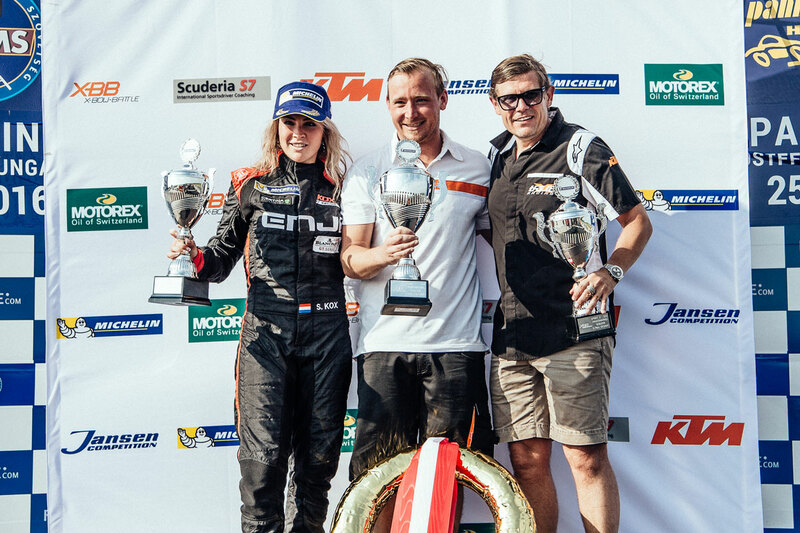 Stéphane Kox participated in the KTM XBow Battle at the Pannonia Ring in Hungary last weekend. The plan was to do an endurance race and one sprint race. During the endurance qualifying, Stéphane was heading for a top 3 laptime, when the gearbox broke and she had to retire. Despite a technical failure, she managed to qualify the car on P7. However, Isert Motorsport could not start the endurance race as there was not enough time to repair the car before the start of the race. The Isert Motorsport boys did an amazing job to repair the car before the qualifying for the sprint race. Two minutes before the start of the qualifying it started raining and Stéphane went out on slick tires. The conditions were really tricky but Stéphane was able to put the car on P3. Stéphane had a really good start in the sprint race and she could immediately put the pressure on the car in 2nd position. After 4 laps she found a gap, overtook and was in second position. She managed to create a gap and kept it, so in the end she finished 2nd, with which she was really happy. Stéphane said: "I am really happy with a 2nd place, and with the pace I could do during the race. I want to thank Isert Motorsport/Kox Racing for their effort and I think we are all looking forward to the next race."